Courtesy of WOWSA, Rottnest Channel, Western Australia. Cyrus Milne, a 17-year-old Australian open water swimmer, has big goals. In August 2020, he will attempt a 33.8 km crossing of the English Channel from England to France. But he is being strategic in building up to this solo attempt. In addition to local ocean races, he first participated in a 4-person relay across the 19.7 km Rottnest Channel in western Australia in 4 hours 48 minutes, then participated in a 6-person relay attempt of the English Channel. In 2017, he finished 69th overall in the 19.7 km Rottnest Channel Swim in 6 hours 27 minutes 44 seconds at the age of 15. In 2018, he finished 81st in the 19.7 km Rottnest Channel Swim in western Australia in 5 hours 33 minutes 48 seconds at the age of 16. 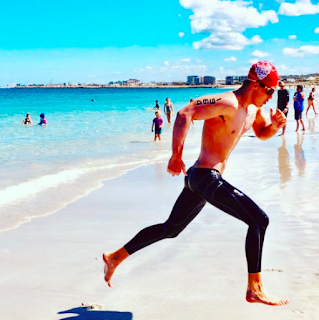 During this year's Rottnest Channel Swim, he will attempt a duo crossing of the Rottnest Channel and a month later, he will compete in the 25 km Port to Pub in addition to competing on the Swimming Western Australia Open Water Series. All leading up to a crossing of the English Channel in 2020.